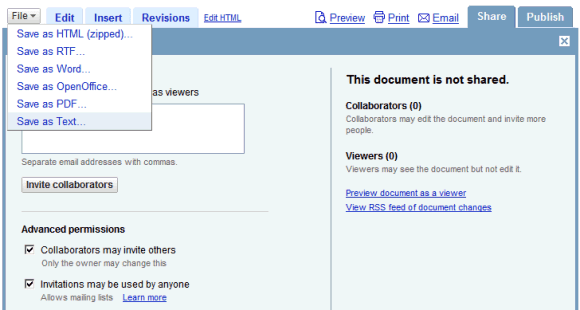 Google Docs improved the way you share your documents with other people. Now you can send invitations to mailing lists, but only 200 people can sign in to the document. Another limitation is that only 10 people can edit the document at the same time. Only 50 people can edit a spreadsheet simultaneously, but there's no limit for the number of people you are allowed to share the spreadsheet. If you select "Invitations may be used by anyone" when you share a file, the same invitation can be used multiple times. For example, each group from Yahoo or Google Groups has an email address for posting messages (Google Groups displays it at the bottom of the group's homepage). There's a new file format for exporting documents: plain text, especially useful if you use Google Docs to edit code collaboratively. For Hebrew and Arabic documents and spreadsheets, you can make the page text align right-to-left in the settings. What I find more helpful for use with mail lists is the direct email feature and then insert into email body.